This beautiful house belongs to a former farm where in the middle of the meadows a place has arisen where you will find besides this accommodation an attractive in and outdoor playground, a restaurant with local specialties and a nice terrace all in the character of the good Burgundian Regional lifestyle. This property is ideal for your family holiday. Children have free use of the playground and facilities. In the house you have the availability of a living kitchen, two living rooms and one bedroom downstairs. Upstairs there are two large family bedrooms. Through the use of many wood the atmosphere in the house is very pleasant. Furthermore you have access to a large (private) garden. The nearby village of Oisterwijk, also known as "Green Pearl", is known for its forests and bogs. In addition Oisterwijk has a very nice city center with an selection of pleasant shops and culinary experiences. 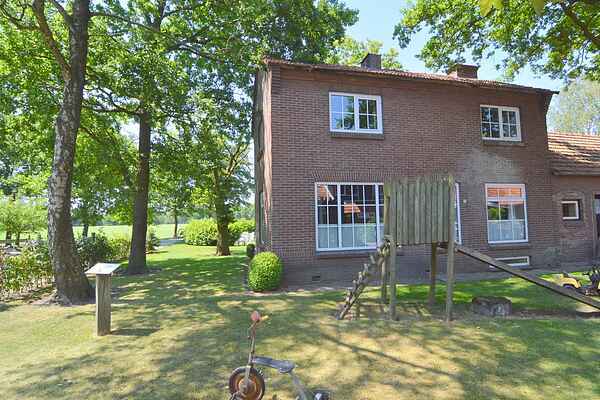 The farm itself is located between two nature reserves parks "Kampina" and "Beerzendal" . No lack of biking and hiking trails here. Not coincidentally there is a charging station for electric bikes by the farm. For a daytrip we advise the amusement park the Efteling and wildlife park the Beekse Bergen.